What a great surprise for all! Our founder, Father Rafael Alonso, came to Lumezzane (Brescia) to have a meeting with the community of the Home of the Mother on November 25. It was a great gift. The evening began at 6.30 pm, with the Holy Mass, presided by Father Rafael in the Don Rovetta Center. 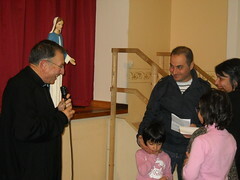 About 80 people attended the mass, many of them came to meet Father for the first time. In his homily, he talked about how to prepare ourselves for the moment of our death, the moment in which we are going to present ourselves before God. 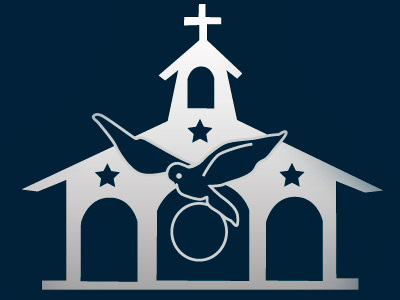 After Mass, a married couple, Gianluca and Maria Teresa, entered as lay members of the Home. They were very happy, as seen in the photo. After the mass, some stayed to have dinner and family conversation together. Once we satisfied our material hunger, we turned to a moment of spiritual nourishment. Accompanying Father was Mother Ana Maria Campo and Sister Paqui Morales, a Servant Sister who recently returned from Ecuador, after having spent about 8 years there. Sister Paqui gave us her testimony about the great work of the first evangelization mission that is currently being carried out by the Servant Servants in some Indian villages in Ecuador. 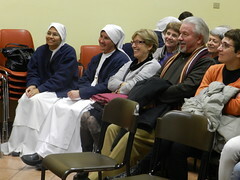 Everyone listened very intently to Sister Paqui. Later we all watched a short video of recordings taken there in Ecuador. It was a full evening and, although we ended a little late, we all agreed that it had been worth the while. Thanks be to God!